Credit Default Swap - What Does It Mean? What is a "credit default swap"? What is the definition of a "credit default swap"? What does "credit default swap" mean? 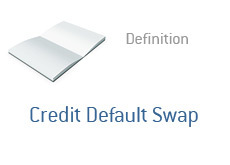 A "credit default swap" (or CDS) is basically a derivatives contract between two different counterparties. Some people like to call it "insurance", but that wouldn't really be accurate. Let me try to break a "credit default swap" down into its simplest terms. Let's say that you are a hedge fund manager. Let's say that you have $100 million worth of XYZ bonds in your portfolio. These bonds are pretty solid, however, you also want to protect your fund in case there is some sort of a cataclysmic occurrence that takes everybody by surprise. In order to protect your investment, you decide to purchase a CDS. In a CDS, two counterparties, as mentioned, enter into a contract. Let's say that these two counterparties agree to enter into a 2-year CDS for $100 million worth of protection for XYZ. The cost will be 50 basis points per year. This means that the hedge fund will pay $500,000 per year (0.5% = 50 basis points) for $100 million worth of protection. If the XYZ bonds default during this two year period, then the hedge fund will receive $100 million from the counterparty. If the XYZ bonds don't default during this two year period, then the hedge fund will be out $1 million ($500k x 2 years). The two parties in this transaction have essentially "swapped" the risk - if the bonds default, the seller of the CDS will need to fork over $100 million. However, the seller needs to be compensated for taking this risk, which is why they will collect a premium. Who might be on the other side of this CDS? All sorts of companies (banks, hedge funds, etc) and other investors. Many of the companies that were pummeled during the economic meltdown of 2008 took a beating due to being on the wrong end of credit default swaps that were now worth a great deal more than what they had originally sold for. Companies who really got into trouble were the ones that sold credit default swaps against mortgage-backed securities. As the real estate market started to implode in 2007, these mortgage-backed securities (which were often loaded with subprime mortgages) declined in value, which caused the credit default swaps that had been written against them to soar in value. This is the trade that made John Paulson a very rich man in 2007. Now, you don't have to own anything in order to buy credit default swaps. They can also be used to speculate. For instance, John Paulson bought credit default swaps for some of the major brokers when he (correctly) came to the conclusion that they would be decimated by mortgage-related losses. Now, he didn't own any Lehman Brothers debt, but he was able to purchase the credit default swaps anyways. At worst, Paulson would lose the annual premiums on the swaps. At best, Lehman Brothers would default on its debt, and Paulson would make an absolute fortune. Many companies that sold these credit default swaps got into trouble because they didn't have anything close to the proper amount of collateral. While the market was still intact in 2006, most of these swaps were seen on "risk-free" money - simply sell the swaps and collect the annual premiums. I mean, there was no chance that the real estate market would actually collapse, right? Credit default swaps are like buying insurance on a house that you don't own. "I'm going to pay $4,000 a year to buy $400,000 worth of protection on this house". On the flip side, companies SELLING the swaps didn't have to have anything close to the proper amount of collateral to engage in these swaps, due to a lack of regulation in the industry. "Sure, I'll take your $4,000 in annual premium to give you $400,000 in protection on this house. If something happens to the house, I'll have to scramble to come up with the money, but the odds of anything happening to the house are so low that we won't even consider it. This is free money to us, and will greatly inflate our profits!" This is the exact reason why AIG got into so much trouble and needed to be bailed out. They had sold an INSANE amount of swaps that suddenly turned sour! The problem with buying insurance on somebody else's house is that you have an interest in seeing that house burn down. John Paulson purchased an unbelievable amount of credit default swaps. If the housing market turned sour (which it did), then he would become a billionaire overnight - if the housing market stayed strong, then Paulson would lose a tremendous amount in premiums. That's the basic gist of credit default swaps - one party is looking to purchase protection against an "event" (such as a default or a credit downgrade), while the other party is looking to generate income by receiving annual premiums from the counterparty in the swap. California - 20% Chance of a Default?